Hello and Happy New Year! I hope you all had a nice relaxing holiday. While we were feeling under the weather for most of it I soaked up all the time with the family and relaxing and it was nice to take a much needed break from the blog. I’m feeling refreshed and ready to jump back into things with some new inspiring ideas and some great things coming this year. What better way to start off the year than an exciting Meatless Monday link-up with my co-host Deborah and a delicious healthy Un-Beetable Avocado Citrus Cruciferous Crunch Salad! If you’re like me you’ve had a few treats (ok maybe more than a few), lots of holiday eats, and wine (a little more wine than usual) and are craving all the healthy fresh foods. I’ve been craving a nice big salad with so much seasonal flavor and texture. This salad is far from another boring green salad. The greens are far from boring as I use a mix (that you can make on your own but it’s so easy to just pick up a mix) with kale, shaved Brussels, broccoli, and cabbage that really packs a crunch and a punch of flavor and nutrition! You really need a strong bed of greens to hold up all the delicious toppings that add so much flavor and healthy nutrition. Yes all about packing in all the flavors and health benefits in this salad to help your body start the year strong! 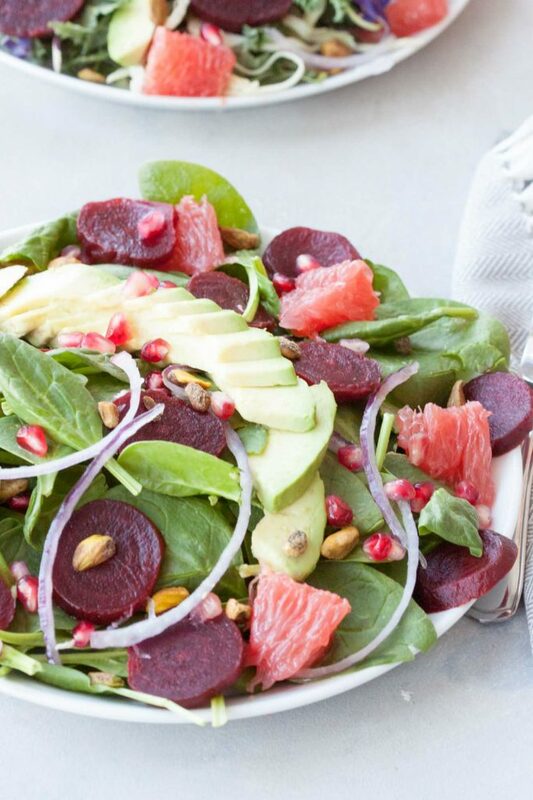 Beets, grapefruit, avocado, pomegranate arils, red onion, and chopped pistachios in this perfectly balanced sweet and savory combo. There is so much flavor you don’t even need a dressing but I like to top with a little vinegar, salt, and pepper or a simple spicy brown mustard vinaigrette sometimes. Another option is to message the greens with a little extra virgin olive oil or avocado oil or mash in the avocado with the greens. It’s simply delicious and will have you craving salads because ones like this are far from boring. It’s cold here, like sub zero cold, and I just escape to somewhere warm and sunny while I eat this Un-Beetable Avocado Citrus Cruciferous Crunch Salad sitting in the chair soaking up the sunshine. The nutritional breakdown. The powerhouse cruciferous vegetables that pack an amazing amount of nutrients into every bite. Kale is high in fiber, as well as anti-cancer chemicals and antioxidants, both of which help cleanse the body of harmful toxins. Kale is also packed with lots of vitamins and minerals (which also help promote detoxification) and is anti-inflammatory. While some people might think kale is so 2015 I’m still over here saying Kale Yeah! Brussels sprouts are low-glycemic nutritious vegetables, exceptionally rich sources of protein, dietary fiber, vitamins, minerals, and antioxidants. Really I don’t even care if their healthy because my oldest and I love our Brussels sprouts and would eat them daily. Cabbage and broccoli are in the same family of green leafy vegetables that also packed with cancer fighting antioxidants, vitamins, and minerals. Beets are another favorite vegetable of mine. They are highly nutritious and a“cardiovascular health” friendly vegetables. They are rich folates, glycine betaine, fiber, vitamins, minerals, and unique plant derived anti-oxidants Great for antioxidant, anti-inflammatory, and detoxification support. Avocado significantly increases your body’s ability to absorb two very important carotenoid antioxidants: lycopene and beta carotene. Carotenoids aid with it’s anti-inflammatory properties. Avocados are also one of the few land plants that carry the fatty acid polyhydroxylated fatty alcohols (PFAs). PFA’s have excellent anti-inflammatory benefits. Pomegranates are rich in powerful antioxidants, have anti-inflammatory benefits, may lower blood pressure, fight against heart disease and cancer. Pistachios are one of my favorite healthy nuts packing an array of phytochemicals and nutrition. Again I’m not a doctor or a dietitian but I do my research and try to pack in as much whole food healthy nutrition into our meals, especially when they taste this good, to help fuel us. I often debate on adding this information to posts and again debated adding it to this one. When it comes to healthy delicious whole foods like these I really don’t need a list of reasons to eat as I know they taste good and make me feel good and that’s all that really matters. Again with my recipe creations I hope they inspire you and if you don’t like a particular food omit it, if you love beets or avocados like I do add more, if you want a bigger meal (although this is very filling) you can add more greens. Maybe you don’t have the mix to make this and no time to run and get it or the time to shave your Brussels and make your own mix that’s ok I even swapped out the greens for baby spinach as those are more my youngest daughter’s A’s speed and it was just as good. It’s all about inspiring others to live their best with healthy creations. As always if I inspire you I’d love to hear your twist, you can comment below or tag me on social media. 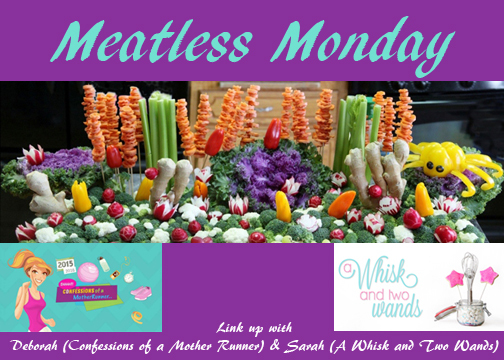 Now to Meatless Monday, it’s always an inspiring link up and we love it when you join or are inspired by others posts! For those who don’t link up how we can further inspire you? For those who link up, again this isn’t about numbers or boosting posts but inspiring and supporting others. Deborah and I have talked about how to bring the Meatless Monday link-ups to the next level and would love to hear from you. We would keep this to once a month not to add stress but to make it fun and challenge us all. We are open to other ideas as well if you have them, so let’s hear them! What would you like to see this year for our 2017 Meatless Monday link-ups? Simple vinegar, salt, and pepper. Massage greens with extra virgin olive oil, avocado oil, or avocado. This salad can be mixed together and served, plated and served individually, or prepared in a container to go. If massaging greens do so now. Otherwise plate or add greens to bowl/container. Slice grapefruit in half horizontally (not from stem to stem). Using a grapefruit knife run your knife around the inside edges of each segment, scoop out with a spoon. Top with sliced cooked beets, grapefruit, avocado, pomegranate arils, red onion, and pischaios. If making ahead squeeze part of the grapefruit juice from one half of grapefruit remains over to prevent browning of the avocado. Prepare dressing if desired, reserving grapefruit for this or if not using for dressing you can squeeze grapefruit to reserve juice for later. Top with optional dressing. Enjoy! Nutritional powerhouse blend of greens topped with delicious flavor come together in an Un-Beetable Avocado Citrus Cruciferous Crunch Salad. Thank you Courtney! Haha oh I know the feeling. We’ve had sweets but lots and lots of bread with the hubby baking sourdough daily and sometimes multiple times. I kept pushing it to see how much my body could handle. Perfect way to pack in all those micronutrients! Hooray for beets! I haven’t had them in such a long time and was just thinking how I need to start incorporating them into my diet again! Oh I love beets and can’t go long without them. Enjoy your beets! Beets and avocado are a fab combo looking forward to getting back on my healthy eating this week. Hi Sarah! This is gorgeous!!! Love all the fresh color in it. Beets are one of my favorite foods that I don’t eat enough of too. Thank you Julie! They are one of my favs, and I would eat them daily if I could. Last week I roasted up pounds of them excepting them to last a week and they didn’t even last 2 days! My husband loves them as much as I do. 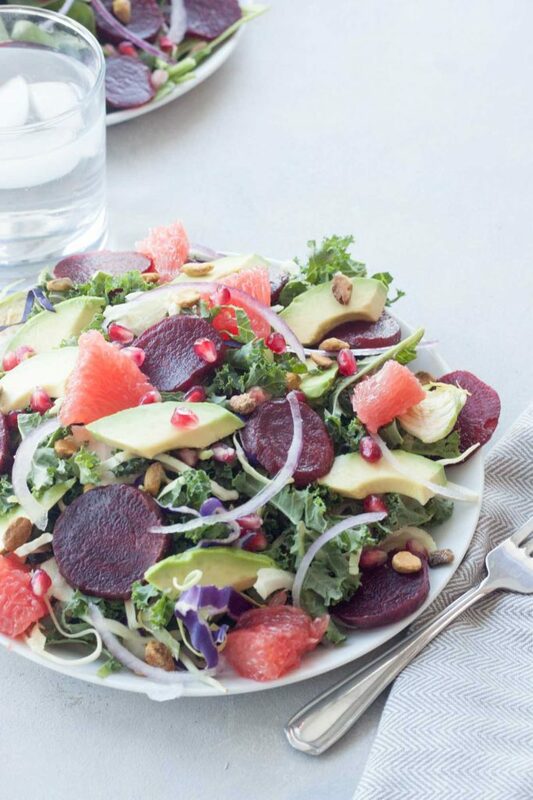 I started craving this salad as soon as I saw the beets and avocado! I hope you enjoy it if you make it, beets and avocado are such a great combo! Oh this is the perfect recipe to kick off the new year! Love beets! Grape fruit! That’s what that is… yummmm. I’m also Team Kale Yeah. It’s my favorite leafy green. Ever. Yes! A little citrus, and their so good right now! Oh kale yeah! What a beautiful salad! I love all of the colors… very festive! Thank you Abbey! Oh I know the feeling! I love beets. Raw and roasted both work great for salads. I do too and couldn’t agree more! I think I’ve only ever had beets once but your pun is convincing me to give it another try! Carmy recently posted…I’m Running a Ragnar! Oh I LOVE beets and can’t get enough, especially roasted beets! I think you need to give them another try for sure! Okay, I love all of these foods together! And love that all of the ingredients are in season!! Thank you they are so good and yes in season. There are days I try to garb all the seasonal fruits and veggies and try to throw them on my salad… just so many options, especially when they’re all so good! Prettiest salad I have seen in a long time! I love the combo! Thank you! It’s full of flavor, color, and nutrition and makes me smile. You have got me drooling over this salad! Yum! Can’t wait to try it! Thank you, I hope you enjoy it as much as I do if you make it! I have never been able to pair beets up but this is a great flavor combination- thanks! There are so many delicious combos for beets! 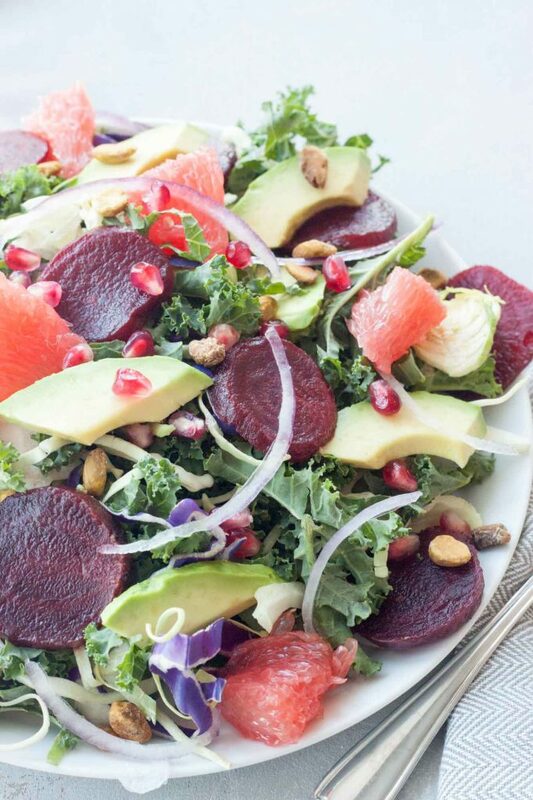 Beets and avocado, and citrus, so many fruits, I just can’t get enough beets… ever! 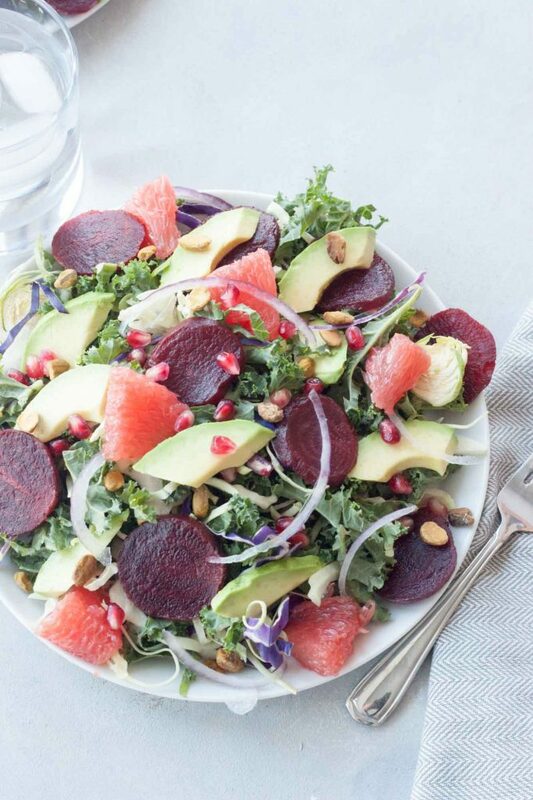 I love the beet – avocado combination. Throw in that citrus dressing and I’m oh so in! It’s just so good! I was going to whip it up with oranges this week. 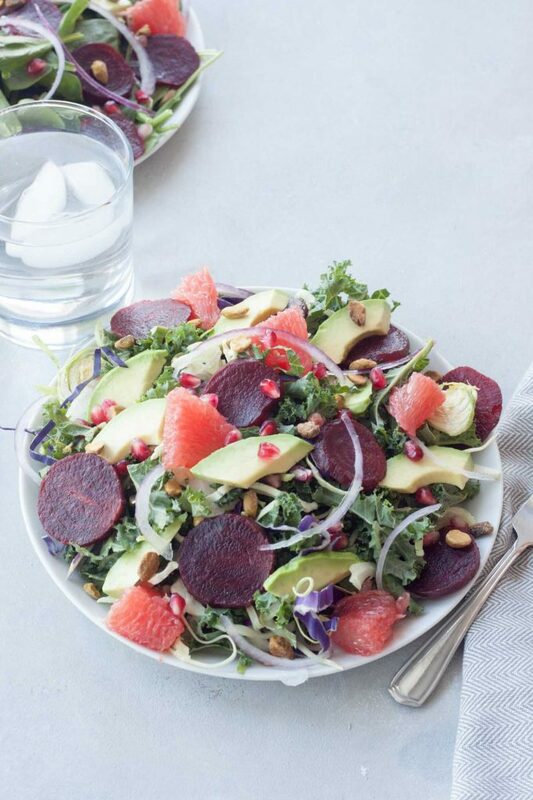 beets + grapefruit are two of my fav things on a salad! love this combo. Thank you Dixya, it’s just so good! I’m trying it with oranges this week since I have a bunch to use up. 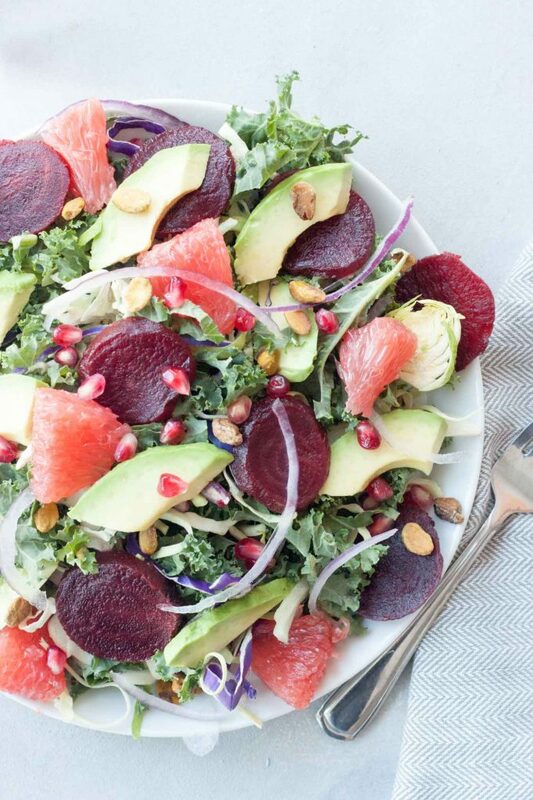 Great flavor combos with the beets and grapefruit. I’m usually hitting warm soups in the winter but I’ll have to save this in my recipe library. Thank you! I’m the same way, I love my soups especially living in a cold weather state but I like to mix things up sometimes and pretend I’m somewhere warm, sitting in the sun eating my salad. I have to admit, so many salad recipes on blogger sites pair ingredients that I would never put together. You put weird things together, but they work! Some of the craziest combos are the best! I often think the same thing with some of my salads, lol. Beet salads are my go-to in the winter. Love all of the fresh vibrant colors of this salad. PS food pun on point! Thank you Christina! Exactly as much as I miss summer produce there is so much to love this time of year as well. Oh my goodness! This looks delicious! I love every ingredient, definitely saving this for later. Thanks for sharing! Sarah, this looks like the perfect salad to me! So many of my favorite ingredients packed into one gorgeous dish! Thank you Sonali, love when salads are packed with all the colors, flavors, texture, and nutrition! I sure love Meatless Mondays! ESPECIALLY when a Salad like this can be eaten! It looks so refreshing! I love all the different colours and flavours of this salad!! The perfect salad to kick off the new year for sure. What a gorgeous salad!! I never thought of combining beets and citrus, but I bet they taste amazing together! Emily recently posted…What if Weight Loss Wasn’t Your New Year’s Resolution? This looks SO good! I definitely need this in my life. Pinning to my paleo board so I can find it. Seriously, yum.